The previous generation: Pearl (the elder), her son Mac and daughter Flash, Bear and Luke. Bear and Flash were parents to Janie and Chance. So here’s the crew, in descending chronological order: Sis (14), auntie to Janie and Chance (11), Pearl, Flynn, Joker and Blaze (3), all Janie’s offspring, and Jax (2) who is Pearl’s pup. And yes, it’s too many. I have perfectly valid excuses reasons for having 8 working dogs, when at most in a day I would need 2, but I won’t bore you with them. Suffice it to say they are all family, and some of them are getting to be really useful in the whole new world of grazing circuits and shepherding. The rest of them just have a wonderful time. The current kids: Janie’s offspring: Flynn, Joker, Blaze and Pearl (who had a completely white head at birth, now cinnamon and salt and pepper). Actually, ALL of them have a wonderful time. Calling them “working” dogs is a misnomer: for them it’s play, not work. In fact, one of the hardest things for Chance is finding his “off” switch. Somehow, in his early training the significance of “That’ll do” didn’t sink in. Maybe he was absent that day. Janie, Chance and me, getting ready to go shepherding last winter. The only difference now is that I don’t use the Polaris, and I’ve given up carrying the crook. A year of hiking up and down my hills has improved my balance, and the crook isn’t big enough for me to catch a full-sized ewe anyway. If I have to catch one, now I just run them into one of my two sets of yards. One of the great challenges of learning to shepherd has been retraining myself and my dogs to work with the flock as a dynamic entity—doing our job to enhance foraging, not simply move sheep. This has been a huge mental change, and we are still grappling with it. Rather than stay behind the flock, pushing or “driving”, I’m now able to lead the flock about half the time while the dogs simply hold the line at the back. Janie and Chance have, on their own initiative, split up the shepherding jobs, with Chance providing impulsion and steering, and Janie keeping the laggards up with the rest. The flock following me through a particularly yummy stretch of paddock I’ve been trying to get them into for months. If you click on the image and look closely at the back of the flock on the left, you can just see Chance’s head. He helped me set up the bias (direction) of the flock, and is awaiting further orders while they graze steadily toward me. The whole flock leadership crisis (see “You Don’t Sing That Note Either”) has sort of dissipated, as I finally realised the bulk of the flock were waiting for me to get out and lead. It’s only my many years of habit keeping me at the back, swearing to myself about the recalcitrance of HRH (aka Old Leader). My cabal of followers, led most often by Horatio, with support from my various pets and their friends, will now almost always come to my bugle call, and follow me through a gate. Their response out in a paddock is less reliable—they seem to be happy to follow as long as I’m going in their preferred direction anyway. 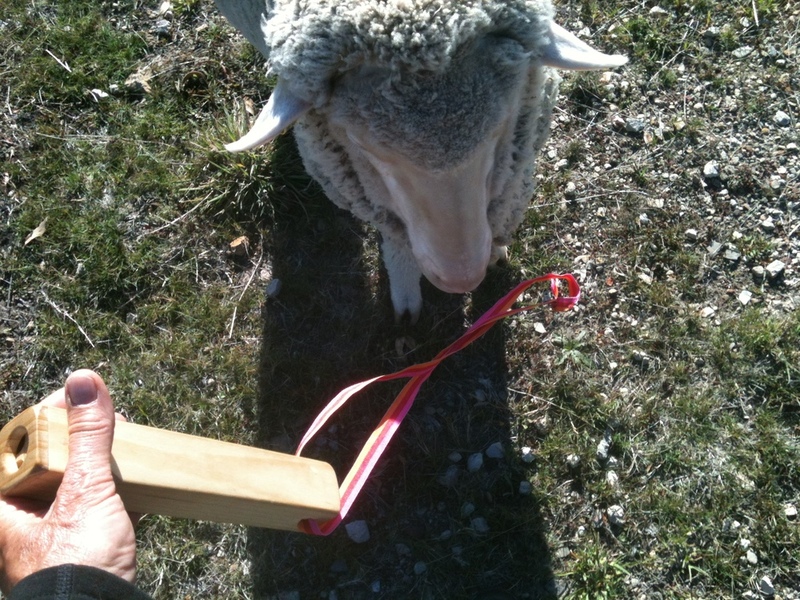 My sheep “bugle”, a wooden “train whistle” instrument. I lost the first bugle just a couple of days after I bought it–dropped it on the hillside, never to be seen again. Hence the bright-coloured ribbon intriguing Vicky, who chews on any strap that is attached to me. Michel Meuret suggested using a bugle to call the sheep, and though it has taken several months to convey the meaning of the call, it is now proving to be most useful. At this stage, it’s only Chance and Janie who join me for the grazing circuit shepherding days. All the others, bar Jax, have had rudimentary training on sheep, but until I’m confident the flock is accepting me as leader all the time, I don’t want to introduce an inexperienced young dog into the equation. 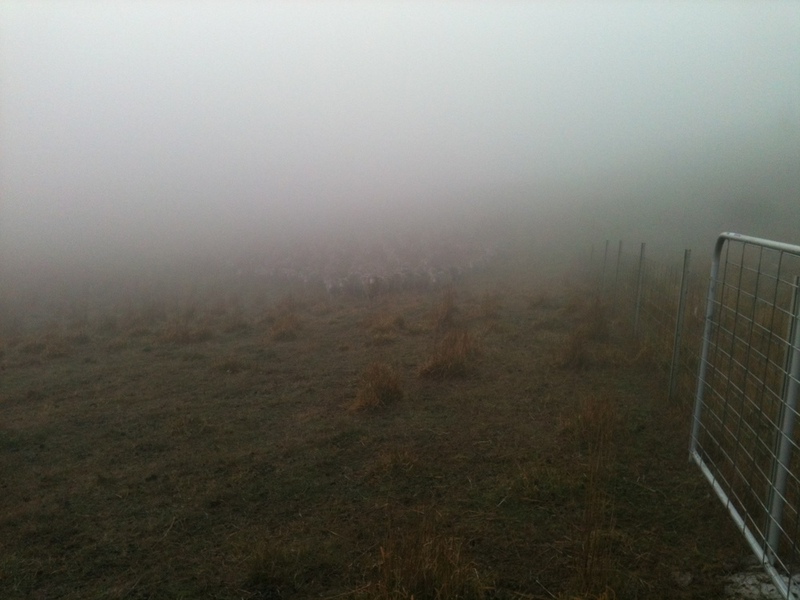 The flock coming to the bugle call through the fog, from about 300 m away. The dogs are in the Polaris–they didn’t play any role in getting the sheep to come to me at the gate. And my old style of training, using a small group of sheep to give me more control over the dog, doesn’t fit with the way I’m now trying to relate to the flock as a whole. So when the youngsters do start, it will be as 2IC to Janie or Chance, and learning on the job with all thousand sheep. Should be entertaining (maybe not the right term). I will probably be the one saying politically incorrect things, possibly at high decibels. Pearl in early training. As you can see, working the dogs on a small group of sheep in a constrained area gets everybody wired, including the trainer. Meanwhile, the youngsters get lots of exercise and fun: 2 long runs each day, amounting to about 12 km, with me driving the electric Polaris Ranger. They also get a bit of time out in the big dog yard to just play with each other and run in laps around the kennels while I’m making dog tucker and cleaning their runs. The early morning run after the first snowstorm of this winter. The five youngsters are just waiting for me get the Polaris moving again. The kennels are a converted chicken coop (“chook house” in Australian), with individual covered runs for each dog, connected to the sleeping box. They have self-filling water troughs, and they also get meat bones to chew on a couple of times a week. I probably spend at least as much of my day taking care of the dogs as I do the sheep. I don’t mind it at all, in fact, I get a great deal of pleasure from the whole process, and am constantly entertained by their energy, inventiveness and joy in life. Cooling off after a big run, last summer. Jax and Joker in the front, Pearl and Jane behind. A bit of farm news: in July I am taking my first trip away from the farm in 2 years (!). I’m heading to the Bendigo Sheep and Wool Show , a huge agricultural and woolcraft show in Victoria. I’ve never been before, so I’m quite looking forward to it. I’ve been invited to speak at the Women of Wool luncheon, and I hope any of you who plan to go to Bendigo will come along and give me moral support. After Bendigo, I’m heading on to New Zealand, to visit Design Spun in Napier for 5 days, to learn more about the combing, spinning and dyeing processes. This will be my first trip to Design Spun, and Chatty (aka Peter Chatterton) has scheduled a spin of WGW fibre to be in process while I’m there. Although I haven’t been to Design Spun yet, a friend of mine from the US, Elizabeth Owens, visited 2 years ago and sent me photos. The final stage of the trip will be a visit to Hinewai Reserve on Banks Peninsula, south of Christchurch, where for the last 30 years or so Hugh Wilson has been using botanical succession to control gorse. Some aspects of his approach I think will be applicable here—the subject of a future Yarn. Hinewai Reserve. Regenerating native forest is edging out the gorse, which can’t germinate or survive in full shade. Maurice White Native Forest Trust. While I’m gone, Lyn Heenan—stockwoman, artist, community activist and WGW enthusiast—will be minding the farm for me. She’ll be here the whole month of July, learning the ropes for the first two weeks, then flying solo while I’m away the second half of the month. 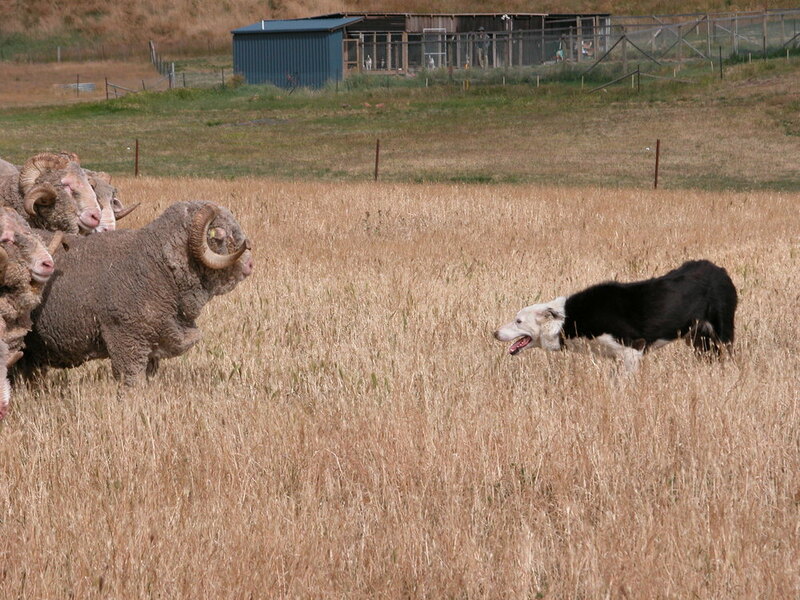 My all-time favourite photo of Pearl the elder, facing down the rams. January 2004. Kennels in the background.